Mike’s youngest brother has been staying with us during the summer for several years now; this year I tasked him with going through some of my cookbooks and picking recipes he wanted me to make. This year a few of the things he decided on was my homemade Garbage Plate, Apple Crumb Pie, Salmon, Quinoa, and Banana Chocolate-Chip Cake. 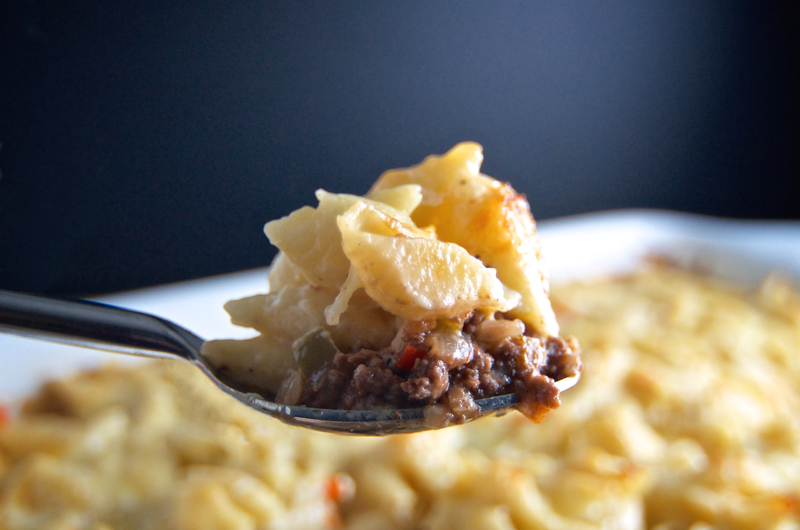 For his last dinner here, he picked this cheesy twist on one of his absolute favorites – Shepherd’s Pie. You can mix and match cheeses but I used two kinds of cheddar and some monterrey I already had; all of which I knew melted really well. Be sure to freshly grate your own cheese. The pre-shredded stuff in bags has a coating with tons of additives, and doesn’t melt well at all. This is a hearty, homey dish; serve with a simple salad for a perfect, comforting meal on a cold or gloomy night. If you don’t want to make the Mutha Sauce, you could buy Dino’s jarred BBQ Sauce, or substitute one of your favorites. If you can’t find the Dino’s Mutha sauce locally, I would recommend something like Stubb’s Original BBQ Sauce instead. Pre-heat oven to 375-degrees. Butter a 9 x 13-inch baking dish or other 3-quart casserole dish, and set aside. For the pasta, bring a large pot of water to a boil. Add salt and stir in pasta shells. Cook according to the package directions, just to al dente. Drain, rinse in cold water and set aside. For the beef, heat skillet over medium heat, add oil, and swirl to coat. 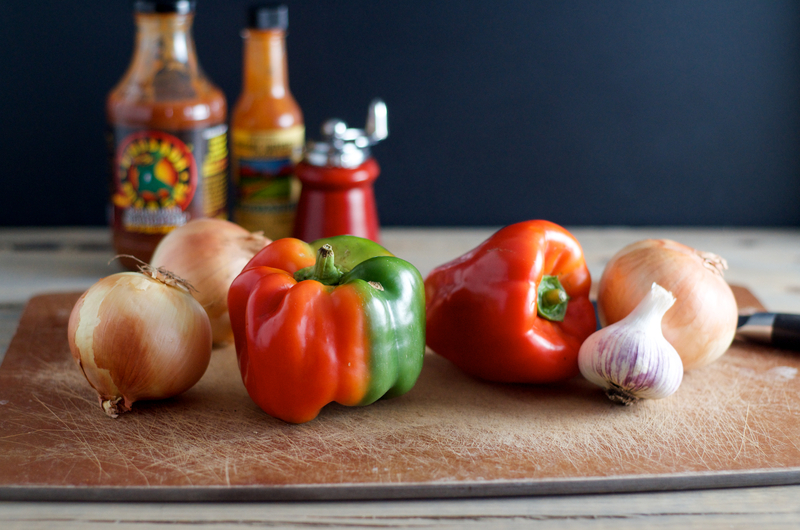 Add onions and peppers, cooking until soft. Add garlic and cook for an additional minute. Add ground beef to skillet, breaking it up with a spoon. Cook with the softened veggies until beef loses its pinkness. Season to taste with salt and pepper. Mix in Mutha sauce and remove from heat. Add beef to prepared baking dish in an even layer and set aside. For the pepper and onion cheese sauce, melt butter in a large saucepan over medium heat and sauté the onions and peppers until soft. Add flour, whisking vigorously until very well blended and raw flour smell has gone away; about two to four minutes. Slowly dribble in the half-and-half or whole milk, whisking constantly to ensure the sauce is nice and smooth. Continue cooking until the mixture bubbles and thickens slightly. 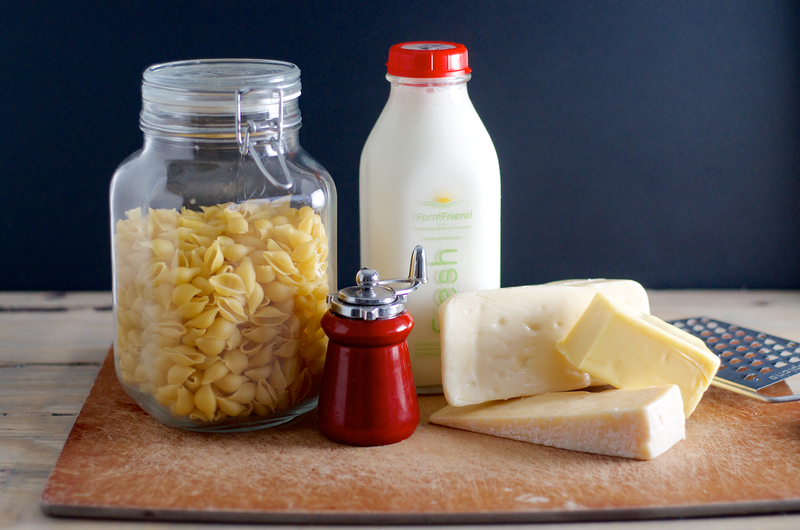 Remove from heat and whisk in 2 cups of Cheddar, Parmigiano-Reggiano, and mustard. Season to taste with salt, pepper and Tabasco sauce. For the final assembly, fold pasta into cheese sauce until pasta is well coated. 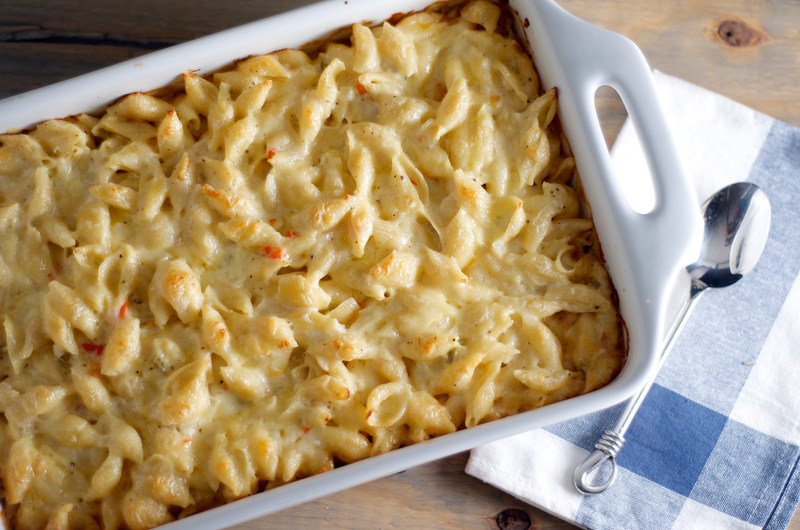 Spread mac and cheese over the beef in an even layer. Sprinkle with remaining cup of Cheddar. Bake in pre-heated oven for 30 to 45 minutes, or until the cheese sauce is bubbly around the edges of the baking dish. Remove from oven and let rest of 15 minutes before serving. P.S. – the mac and cheese is pretty killer by itself. You can skip the meat layer altogether and continue with the rest of the recipe as directed. Cavatappi, fusilli, penne or standard elbows would also be great for the plain mac and cheese. 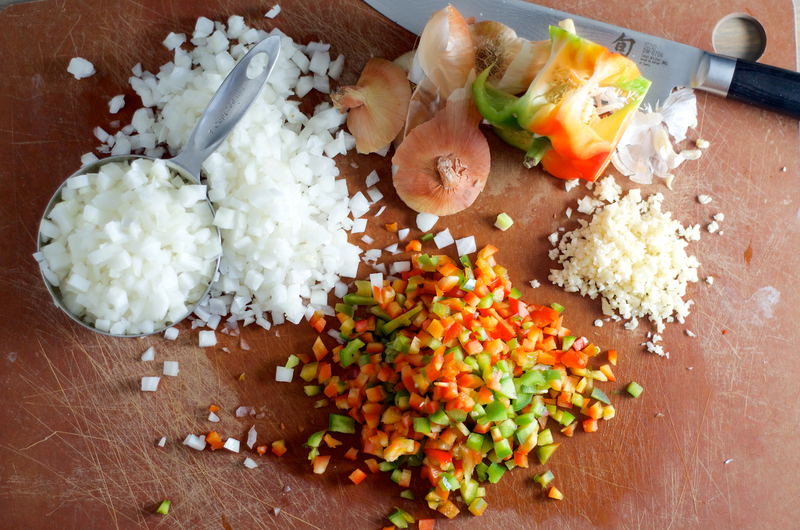 I’d even suggest adding a bit of diced ham to the sautéd onions and peppers, or crumbling some crispy bacon over each bowl when serving. Well this is just genius! I am totally in love with the flavor combo!